Changes are coming to the region’s Mexican dining scene with new restaurant openings, closings, and expansions – plus a special pop-up event next week and more news for local eateries. 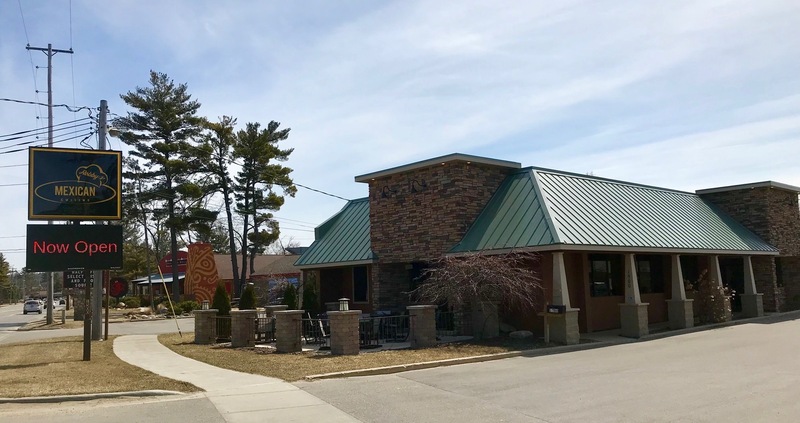 After opening a second location in September on Garfield Avenue near the Cherryland Center, Robby’s Taqueria TC Mexicana owners Rosalba Montes (Robby) and Mike Leko are bringing their franchise to the east side of Traverse City with a third location opening this week. Robby’s Mexican Cuisine is taking over the former Calypso Mediterranean Grill space at 1500 US-31. The new restaurant officially opened its doors Tuesday, with a menu mostly drawn from the franchise’s original location at 830 East Front Street. A few additional items from the Garfield location, Robby’s Mexican & Spanish Cuisine – which highlights tapas, paella, and other Spanish dishes in addition to Mexican food – will also be featured on the East Bay menu. Leko says by the end of April, the Front Street and East Bay locations will have identical menus. All three restaurants offer full bars, with an expanded margarita menu coming soon to both Front Street and East Bay, Leko says. “We have had a lot of requests from our customer base for a location on the east side,” Leko says of the new location. “With the amount of hotels, the State Park, and all the houses on the east side, we thought this location would be a great fit." Agave Mexican Grill is also expanding its franchise. In addition to its locations on Garfield Avenue and next to Buffalo Wild Wings, the restaurant recently opened a streamlined version of its eatery in Interlochen called Agave Express. The restaurant is open seven days a week and offers taco, tostada, quesadilla, torta, and burrito platters, plus Mexican sides, desserts, and a kids menu. Agave Express offers both dine-in and carry-out options, and hopes to add delivery soon, according to a restaurant representative. Agave is also preparing to open a new location in the Grand Traverse Mall. The representative says the restaurant – located in the former Bagger Dave’s space – should open this month, with the company just waiting on the transfer of its liquor license from its location next to Buffalo Wild Wings. That location will close when the new mall restaurant opens. After several months of rumors, La Señorita President Jeff Leslie officially confirmed this week that the restaurant’s original Traverse City store at 1245 South Garfield Avenue is closing. Leslie said La Señorita will host a charity auction on April 20 at the Garfield location. “Because of the history and great relationships formed over the past decades, we want to offer decor along with small items to our guests,” says Leslie. Doors will open at 10am, with the auction beginning at noon. All proceeds will benefit the American Red Cross of Northern Michigan. In downtown Traverse City, Mama Lu’s taco shop will host a special one-day pop-up restaurant in partnership with Glendale Ave. on Monday (April 8). Currently operating on a rotating basis inside The Little Fleet and Mammoth Distilling, Glendale Ave. – owned by husband-and-wife team Bray and Brittney McCabe – recently announced it will expand to a full-time food truck in The Little Fleet lot this summer. Says Mama Lu's co-owner Adrienne Brunette of offering the McCabes use of their restaurant space for a day: “We thought it would be a fun idea to give our guests something other than tacos for a day, all while being able to support people that are like-minded." The Glendale Ave. pop-up will operate in Mama Lu’s Monday from 11am until 10pm or sell-out. The menu will feature Glendale Ave.’s signature Smash Burgers, Fried Chicken Sandwiches, and Smothered Fries, plus special collaboration dishes with Mama Lu’s and a full bar. Other entrepreneurs with food truck roots are also continuing to grow Mexican dining options in the region. Taqueria Las Lagunas held a grand reopening last weekend for its new season this summer outside Barrels & Barrels in Suttons Bay. Chef Juan Carlos Guillen specializes in tacos including carne asada, pork, chicken, and whitefish, plus burritos, quesadillas, and chimichangas, among other items. The food truck will operate this weekend daily from 11am to 9pm. Meanwhile, husband-and-wife duo Tavo and Tarrah Hernandez have expanded their popular food truck Taco ‘Bout It into a brick-and-mortar restaurant. Formerly serving from their truck at rotating locations throughout northern Michigan, the new Taco ‘Bout It Mexican Fusion restaurant officially opened last week on River Street in Manistee.